Locked in a safe in Sydney's St Philip's Church, the Fleet Bible has been signed by every monarch to visit Australia in the past century. In some cases the Bible was taken to Government House for the occasion. Church rector Reverend Justin Moffatt says the book has an "extraordinary place in the European history of Australia". Brought out in the First Fleet, the large leather-bound Bible is inscribed with the address of Botany Bay. It is believed to have been used by chaplain Richard Johnson to conduct the first Christian service in the colony. The morning prayer service would have provided solace for the convicts after their long passage from England, Reverend Moffatt said. The Bible is charred in places, bearing the marks of a fire in 1798 that destroyed Sydney's first church. Paying homage to this history, every Royal to visit Australia has visited the church on York Street to leave their mark. The first, in 1920, was Edward VIII, who is renowned for his scandalous abdication of the throne to marry American divorcee Wallis Simpson. 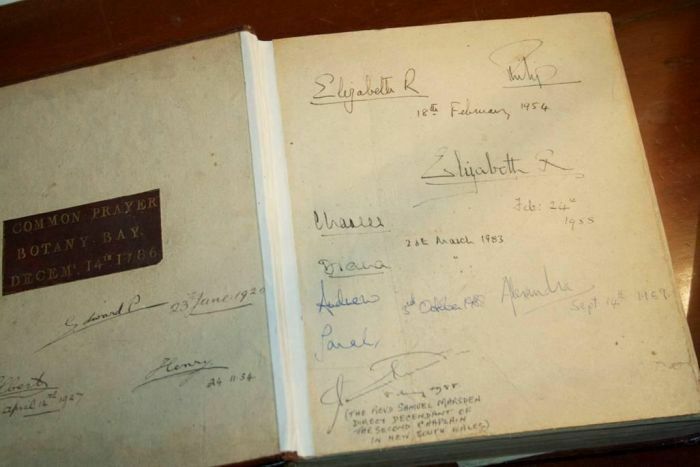 George VI - known as Albert or Bertie - and his wife, Elizabeth, also signed the book. Their daughter, Queen Elizabeth II, signed it in 1954 when she was on a whirlwind tour of Australia, visiting 57 cities and towns in about as many days. Newlyweds Prince Charles and Diana penned their names in 1983. "I'm very happy that Will and Kate have taken the time to look, understand and sign this precious book," Reverend Moffatt said. "[Christianity is] at the heart of the First Fleet and at the heart of the settlement in Sydney. 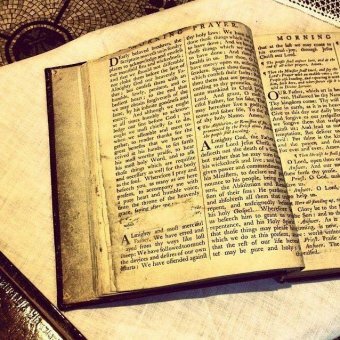 "Very few people know about this Bible and this prayer book which is a pity."